Oh, right – we still have a regular game tonight. Let’s take a look, shall we? Jason should wager 5,200 to cover Casey. 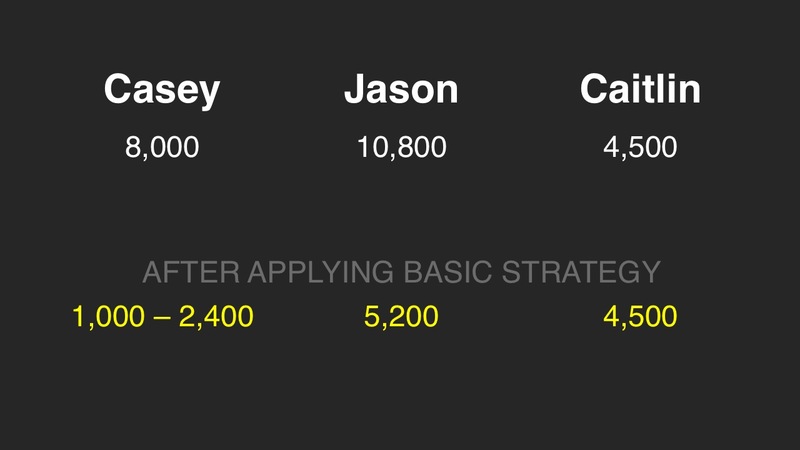 Casey can wager up to 2,400 to stay above Jason if they’re both wrong. Caitlin is still alive, but must get it right, so all-in is the right play. Since we expect Caitlin to wager everything, Casey should wager 1,000 to cover Caitlin. OK, now let’s get it on. Jason should still wager 5,200 to cover Casey. 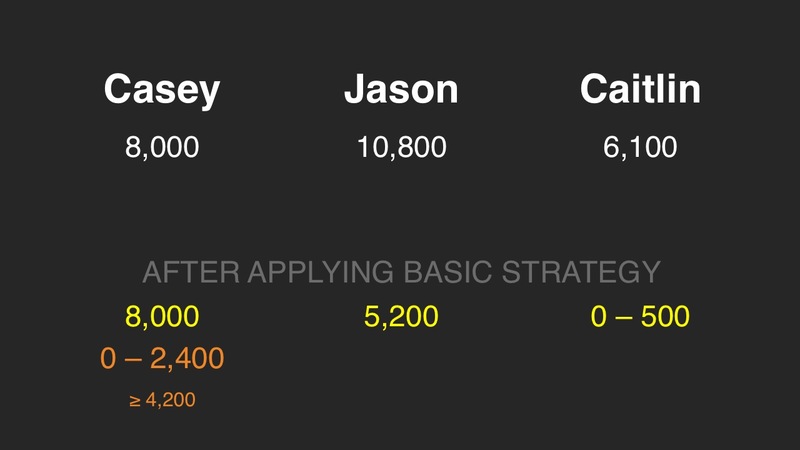 Casey can still wager up to 2,400 to stay above Jason if they’re both wrong. Caitlin can now wager up to 500 to win on the triple-stumper. This is an important difference! Casey should wager 4,200 to cover Caitlin. That wager would cause Casey to fall below Jason if they both miss, so Casey should wager everything if she wants to go big. 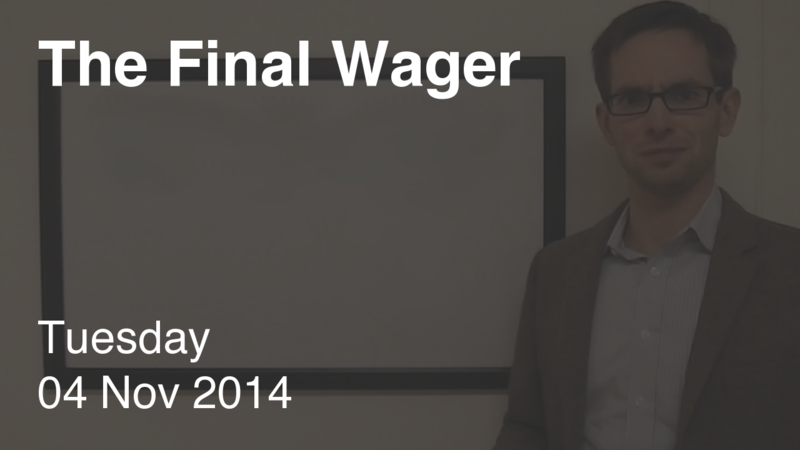 Casey would need to wager at least 2,800 to cover a zero wager by Jason, which is too much. All-in, again. If Casey wagers 2,400, her total will be 10,400. In response, Jason might wager up to 400. The problem with this is he risks getting passed by both opponents, so it’s not a viable option. If Caitlin gets it right, she will have 6,600, so Casey might consider capping her wager at 1,400 to cover that possibility. In response, Caitlin could wager at least 3,300 – or, preferably, everything. I sympathize with Jason here – he had the right response, went back, misread the clue, didn’t pick up on the (very short) FDR, and cost himself the victory, despite his under-bet. Casey went for 3,800, which is what she would have had with the 4,200 wager. This is why it’s easier to go for everything – and, in this case, it would have given her a tie had she and Jason both nailed Final. Who was William Howard Taft? The link in the calendar for this game also gives the 404 error.